Butterflies are one of nature’s most extraordinary gifts, certainly making our world a whole lot more colorful, but that’s not all they do for us. Butterflies are food– caterpillars provide a tasty meal for wasps, ants, spiders and even dragonflies, while adults provide food for toads, snakes, lizards and many bird species. Butterflies are “cleaner-uppers”, eating rotten fruit. Butterflies pollinate our flowers. Many adult butterflies drink nectar from the blossoms in our gardens. Just like bees and other pollinators, the butterfly picks up pollen while enjoying the nectar. This pollen gets carried off to another flower – thus helping to pollinate a plant species. About one third of the food we eat depends on pollinators. Scientists use the absence or presence of the monarch butterfly to measure the health of our ecosystem: both adult and larva are highly sensitive to pesticides. Climate change also impacts the butterflies because fluctuations in temperature and rainfall amounts alter their migratory patterns. Loss of cover and habitat due to deforestation, construction and certain commercial farming practices also harm their migration and reproduction behaviors. Say hello to milkweed and butterfly weed. Aesclepias (the Latin name) are “must haves” in the garden for anyone interested in helping monarchs to survive! You can be a valuable pit stop in their 3,000-mile journey to their winter home in the Sierra Madre Mountains of Mexico. 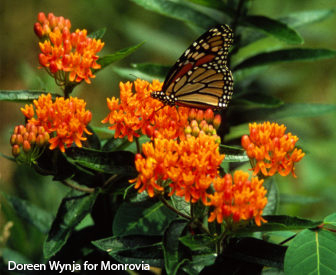 During its caterpillar stage, the monarch butterfly eats only milkweed plants. Each butterfly has evolved with specific caterpillar host plants. Host plants can be situated behind others, as in a perennial planting, to cover the sight of munched leaves. Enticing, nectar-providing plants can be front and center. Click here for a list of nectar and host plants that will grow well in Westchester, New York. At The Lazy Gardener, we can help you design a magnificent eco-aware butterfly garden; and even create a Monarch Watch Certified Waystation. Remember, keep it chemical free, nectar rich and native!